The advocate's wife also alleged that the Delhi Police officer who assaulted her husband also threatened him to leave the Pradyuman Thakur case. 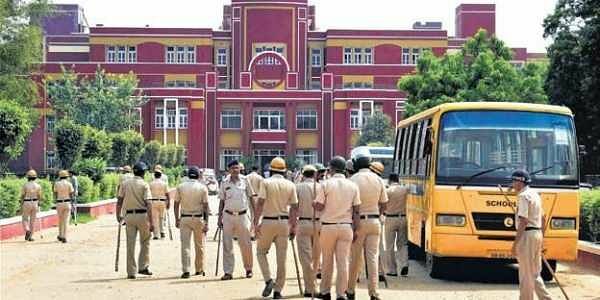 File photo of police outside Ryan International School, Gurgaon, where the murder of schoolboy Pradhuman Thakur happened. NEW DELHI: Sushil Thekriwal, the counsel of murdered Gurguram schoolboy Pradyuman Thakur, was on Saturday evening attacked by a Delhi Police official here, his wife said. Police, however, denied it. Thekriwal's wife Mamta Thekriwal told IANS: "We were attacked by a Delhi Police officer outside Ashoka Hotel here." She also said that the couple and their son had gone to Ashoka hotel for dinner and the incident happened around 8.30 p.m. when the family came out. She also alleged that the Delhi Police officer who assaulted her husband also threatened him to leave the Pradyuman Thakur case. "The Delhi Police officer also misbehaved with me when I tried to make the video of the incident," she alleged. Thekriwal identified the Delhi Police cop as Sanjeev Singh Yadav, through his name plate on his uniform. Pradyuman Thakur, 7, a student of class 2 at Ryan International School was found murdered in the school premises on September 8. However, a senior Delhi Police official denied the incident, saying the lawyer was only restrained as he had strayed into the "VIP route".